In 10-inch skillet, heat oil over medium-high heat. Season steak with salt and pepper; add to skillet. Cook 2 to 3 minutes, turning cubes, until lightly brown on all sides. Transfer to plate; reduce heat to medium. Add bacon to skillet; cook and stir 2 to 3 minutes, until just beginning to brown. Add onion, bell pepper, tomato paste and garlic; cook about 5 minutes, stirring occasionally, until vegetables soften. Add paprika; cook about 1 minute or until fragrant. Add broth; reduce heat to medium. Cook 5 minutes. Meanwhile, in small bowl, stir Bisquick™ mix, 1/3 cup sour cream, the milk and chives. Add browned beef to goulash. Drop dumpling dough in 6 generous tablespoonfuls on top. Reduce heat to medium-low; cover. Cook 8 to 10 minutes or until dumplings are cooked through. Serve with 1/4 cup sour cream on the side. Hungarian paprika usually comes in two varieties, sweet or hot. 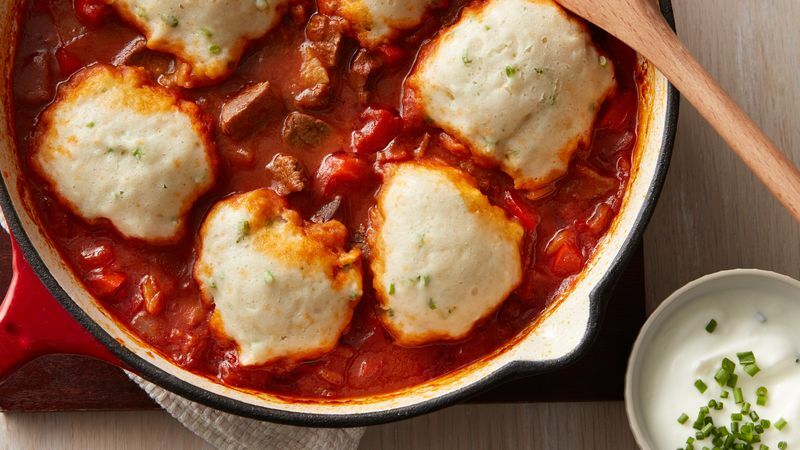 We used the sweet variety in testing this recipe, but if you like your goulash spicy, you can use hot or a combination of both. Adding sour cream to the dumplings gives them an added flavor, richness and tenderness.